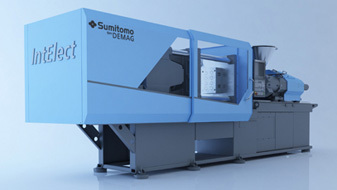 The fully-electric machine concept from Sumitomo (SHI) Demag is based on innovative direct drive technology. Direct drive machines offer increased energy efficiency while their greater responsiveness ensures that they can achieve higher levels of precision, improved repeatability and shorter turnaround times than indirect electric drives. That means our electric machines are best equipped to solve the challenges faced by manufacturers of mass-produced precision parts. The increased efficiency delivered by direct drives means that they use considerably less energy than hydraulic machines – in the case of the IntElect between 40% and 85% less than conventional solutions. And because electric drives generate less heat than their hydraulic counterparts, they require less cooling than conventional machines of a similar size, thus reducing the burden on your electrical infrastructure and the investment required when building new premises. The IntElect is available in two versions: smart and performance. Both feature fully-electric direct drive engines generating up to 220t of clamping force to drive the main axles of the clamping unit and the injection unit. Both versions also have an extensive catalogue of options and a standardised modular automation solution. …so it’s important to have a reliable partner at your side. And the IntElect represents the ideal partner, combining all the experience gained in the completion of over 30,000 electric machine installations worldwide. Whether your business is automotive engineering, electronic engineering, clean-room medical technology, packaging or micro-technology, the IntElect is the ideal machine whenever the situation demands repeatable production of precision-moulded parts. The smart version combines a drive technology specifically designed to support injection moulding processes with solid German engineering delivered by our manufacturing facility in Thüringen. The result is a high-precision, dynamic, resource-efficient injection moulding machine that represents excellent value for money. for the highest levels of precision, fast dosage and injections. The constant L/D ratio (20:1) ensures increased melt homogeneity for even the most difficult colourings. Automatic cylinder detection facilitates fast turnaround times and flexible retooling for different product runs. allowing integration of a hydraulic module into the machine bed for machines of up 160t clamping force. Can be used for several machines. The performance version uses water-cooled direct drives throughout and is the best solution for special clean-room environments. allowing integration of a low-noise hydraulic module. Can be used for several machines.